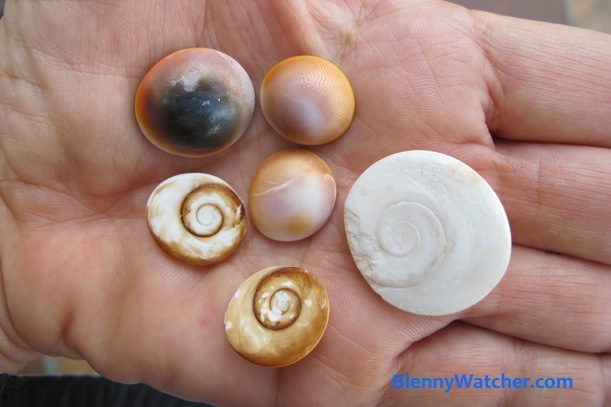 Blenny Watcher beachcombing finds: Do you know what these are? The “parrotfish beaks” below that I found on a previous trip to Bermuda are not from parrotfish at all – they are chiton shells. An alert reader corrected me. You can read about it in that October 2012 post, where I also posted a picture of a real parrotfish beak, taken in the Bermuda Museum. August 2012 ~ Cleaning up my library curio shelf last week, I relived some favorite dive and shore excursions through the odd bits that I picked up: mantis shrimp claws, parrotfish beaks, tiny internal shells of an oceanic squid-like creature. 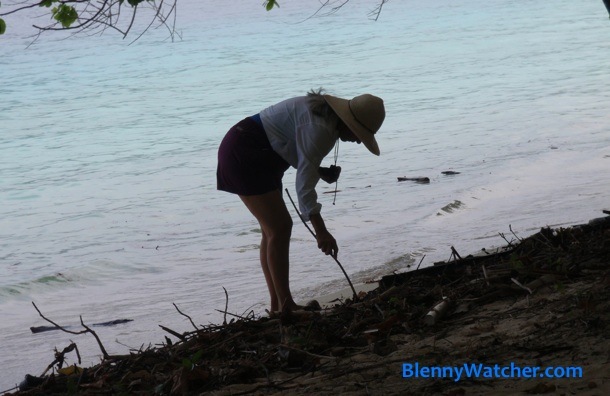 I don’t know why I am compelled to collect these things but our travels afford me many opportunities to explore beaches, some on very remote and little visited islands in the tropics, and I can’t resist carrying home a treasure or two. 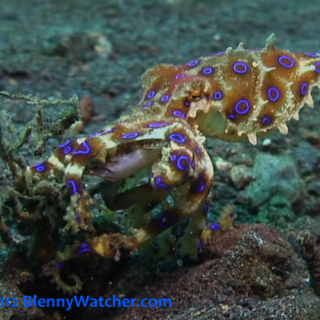 So, I’m going a little off topic today on Blenny Watcher to share some of my favorite beachcombing finds. 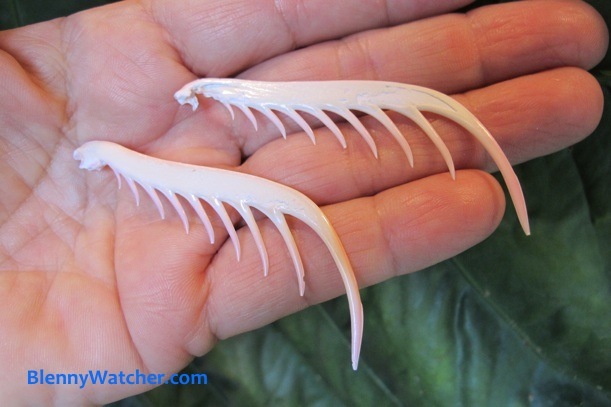 I found these mantis shrimp claws underwater, one in Indonesia and one in the Philippines. I won’t collect shells underwater because even an empty one might serve as a home for something like a small octopus or hermit crab, but things like mantis claws and marbles (I have found marbles in some surprising places) are fair game. Mantis shrimps (they are crustaceans but not really “shrimp”) are divided into two groups, spearers and smashers, depending upon their claws (mine are from spearers), which they use to spear or club their prey. I read that they molt and replace their claws every few months – that made me feel better about finding these in the rubble. Parrotfishes get their family name because of their fused teeth that look like a parrot’s beak. Over the years I have found many broken pieces but my biggest haul of intact “beaks” came from Bermuda. I’m not sure about the one in the bottom left of the photo – might be from a different fish. 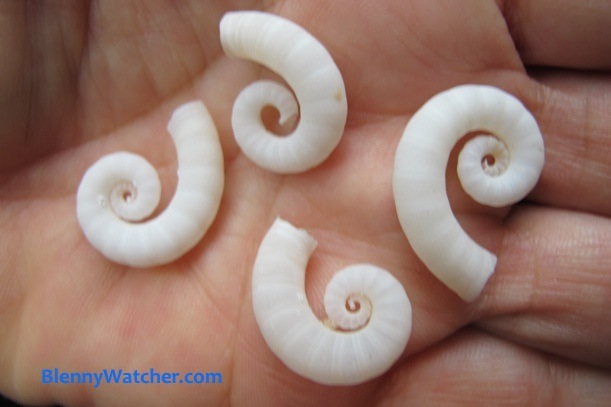 These small coils are the internal shells from a small squid-like creature, Spirula spirula. The shells are gas filled and chambered and have tiny pinholes that allow the animal to control its buoyancy. 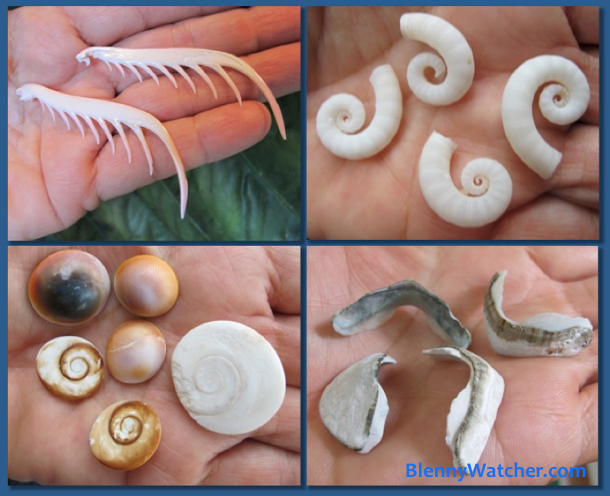 Sometimes called rams horn shells, they are fairly common on oceanic island beaches, but extremely fragile so they are difficult to transport home. These dome-shaped “shells” are opercula of several species of gastropods (snails). Sort of like a boat hatch, they seal the opening of the shell, in this case to prevent a predator from accessing the soft body of the snail. I find these both underwater and on the beach. I think these are also commonly called cats eyes. Sea beans are my favorite finds. 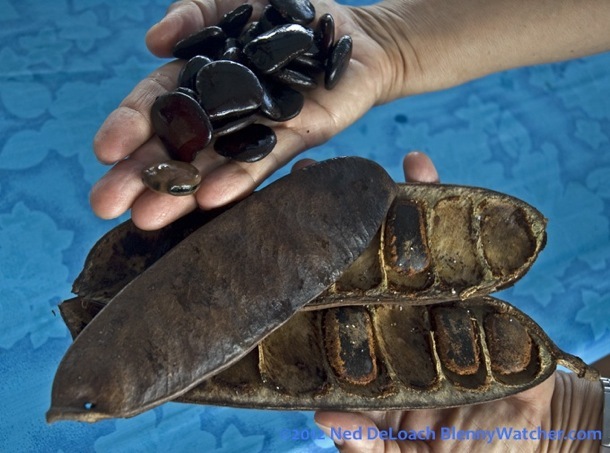 Sea bean is a catch-all name for various tropical drift seeds that wash down from forests and float on ocean currents until cast on the beach. I find too many to haul them all home these days so a photo usually suffices. I am going to save most of those photos for a post all their own, but one of my favorite beaches was Kicha Island in the Solomons. There were loads of sea beans but the most memorable part of that excursion were the lovely, melodious bird songs that drifted out of the trees as I picked my way down the shore. One of my favorite beachcombing books is Flotsametrics and the Floating World by Curtis Ebbesmeyer and Eric Scigliano. In addition to being highly entertaining and informative, it gave some validation, at least in my mind, to my compulsion to spend hours sifting through the wrack. Your “parrotfish beaks” look like chiton shells to me. The rounded one at bottom left is the head shell. Ohhhh…that is so interesting! I picked up several intact chiton shells yesterday so will be great to compare. FYI, the intact “beaks” came from a beach where hundreds of parrotfishes feed in the shallows just offshore – no rock habitat for chitons, which is why we assumed parrotfish. Thank you for the info – will post photo of yesterday’s chitons next to these, when back in the country next month. Neat stuff! The seed pod took me back to my childhood in Kentucky. The Kentucky Coffee Tree has pods like that. We’d also find the seeds in cow patties. AAMOF, they changed the state tree to the KCT when I was in high school. Whilst back for a trip to Mammoth Cave a few years ago, I learned that they had changed it back to the Tulip Poplar. Thought of you yesterday when going through the day’s pics from BHB. 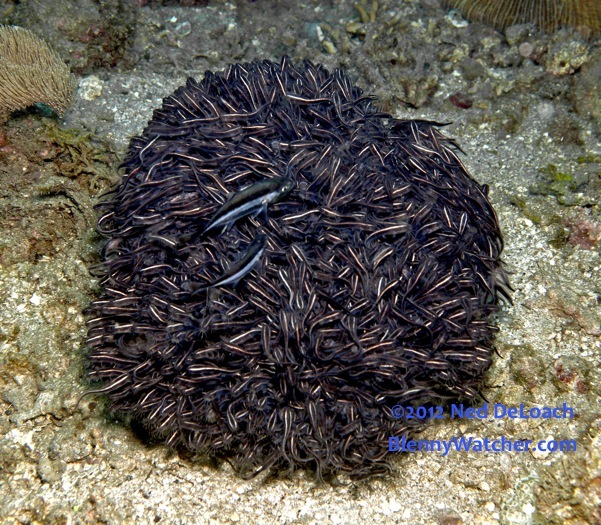 One of the Sailfin Blennies had a face full of bristles. Posted on ScubaBoard. . . Thanks Kevin! 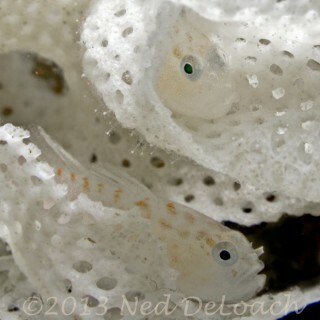 BTW – where, on ScubaBoard is your blenny photo posted? 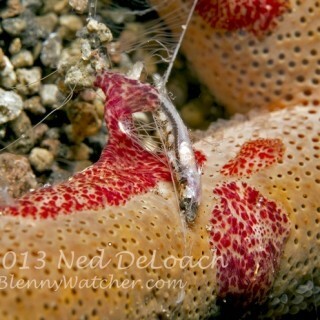 Note from Anna: I know this link is off-topic but the blenny pic is cool.